Quadruple or Duple – What is the Time Signature? Is there a difference between Quadruple or Duple in Simple Time? When looking at a melody/rhythm, how can you tell whether the Time Signature is 4/4 or 2/2 Time? If this confuses you, you are not alone! This Blog will look specifically at the Tips to Tell whether the Time Signature is 4/4 or 2/2. What is Simple Quadruple or Duple? First of all - what is Simple Quadruple Time and what is Simple Duple Time? Simple Time is a Time Signature with a Top Number of "2", "3" or "4". Simple Duple Time is a Time Signature with a Top Number of "2". There are 2 Basic Beats per measure. Simple Quadruple Time is a Time Signature with a Top Number of "4". There are 4 Basic Beats per measure. This concept is taught beginning on Page 95 of the Ultimate Music Theory Basic Rudiments Workbook. 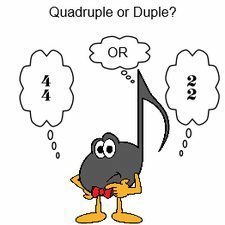 Question #1 - Simple Quadruple or Duple? Add the correct Time Signature under each bracket. As you can see, I "proved" my answer by Scooping each Basic Beat, adding the Basic Beats and adding the Pulses. Why is this acceptable? Simply because the Scoops, Basic Beats and Pulses work here too! So either of these answers would be correct as there is simply not enough "musical information" for us to argue either way. The first tip is to look at the beaming of the eighth notes. If the eighth notes are beamed into obvious groups of 2 eighth notes, that is a good tip to tell that you are in Simple Quadruple. If the eighth notes are beamed into obvious groups of 4 eighth notes, that is a good tip to tell that you are in Simple Duple. If you are a Composer, please remember that it is always best to join your beams according to the Basic Beats! It makes it easier for all of us to feel that pulse! For each of these examples using triplet eighth notes, Clap the Rhythm with your hands, Tap the Steady Basic Beat with your foot and Feel the Pulse. Which Pulse is easier to "feel"? Please note that it is "acceptable" to use this triplet pattern in 2/2 time. There is no law prohibiting Composers to write it. However, do you find it as awkward as I do to "clap the rhythm, tap the Basic Beat and feel the pulse"? How about these Triplet Half Note rhythms? I learned a long time ago to "never say never" in theory. But if you were a Composer and you wanted me to play Triplet Half Note Rhythms, I would really prefer that you wrote the music in 2/2 (Simple Duple) and not in 4/4 (Simple Quadruple)! Rap - Count aloud and "feel" the pulse (use a louder voice for the Strong and Medium pulses, and use a softer voice for the weak pulses). Which Time Signature do you prefer? 4/4 or 2/2? "Clap, Tap and Rap" each rhythm. In the Answer Book, we have answered with 4/4, as that is the preferred answer. However, 2/2 is also acceptable. When looking to add the Time Signature to a rhythm that is either going to be Simple Quadruple or Duple, ask your student to "prove it". Can they comfortably and easily "Clap, Tap and Rap" it? Having students clap the rhythm, tap the Basic Beat and "rap" the counting (out loud) is a vital part of ensuring that they See, Hear and Feel the pulse. And it makes it easier to identify whether that Time Signature is Simple Quadruple or Duple! 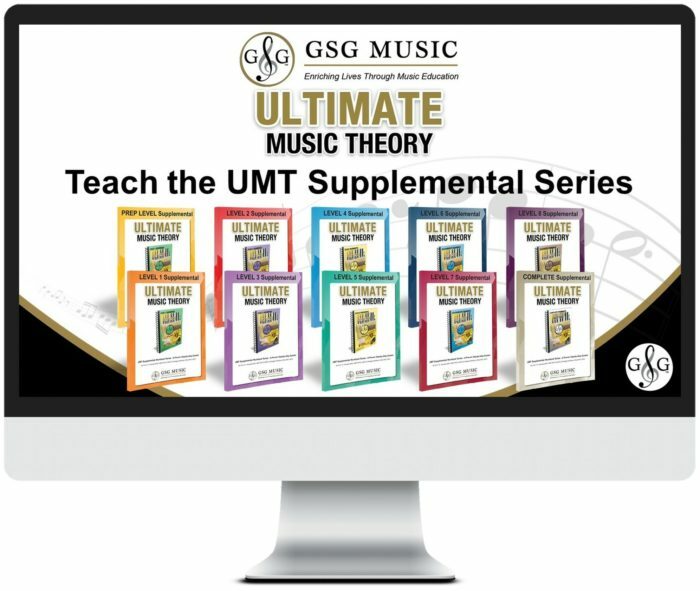 The Ultimate Music Theory Series teaches theory using a proven methodology that ensures that students are successful. Many countries, states and provinces have specialized Music Programs with their own set of theory requirements. 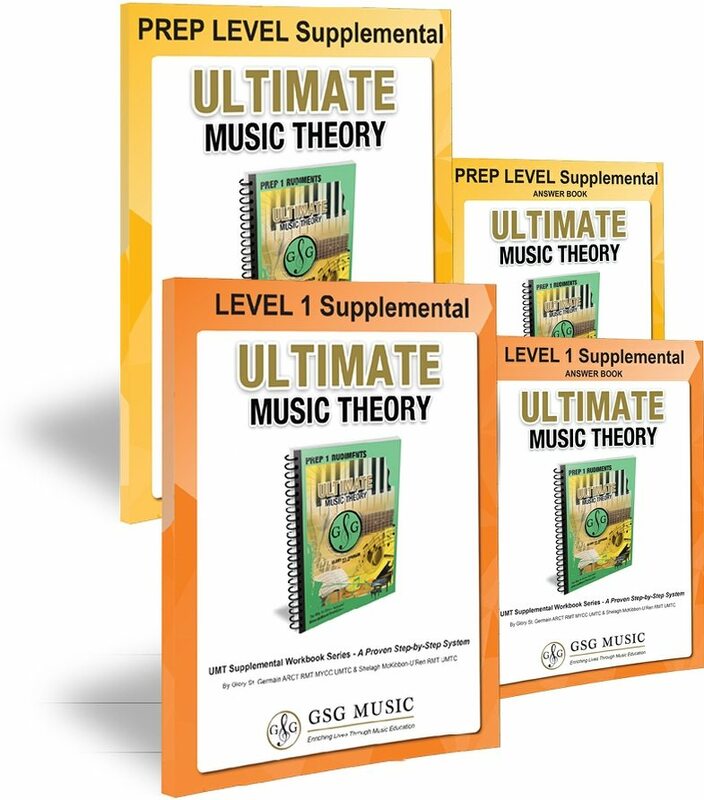 The Ultimate Music Theory Supplemental Series will, when used with the Ultimate Music Theory Workbooks, meet the requirements of the Royal Conservatory of Music 2016 Edition Theory Syllabus. We even have a UMT Prep Level and Level 1 Teacher Pack, with the workbooks and the answer books, to save you money! The Supplemental Series also introduces Melody Writing and Composition. Building from the concepts in the Prep Level Supplemental Workbook, students will take their theory and their playing to the next level. Even if you are not an "RCM" teacher, you can use these Workbooks with your students.